And just like that, I now have a pile of thank you’s to send out! With Christmas over, I had to whip up just a few more thank you cards to send out. 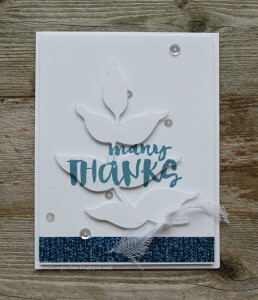 I love this sentiment from a Simon Says Stamp & Wplus9 collaboration I got a while ago and use it a LOT. I thought it would be a nice focal image here again. I thought it would create some fun visual interest stamping on the leaf and the white layer separately, so I first die cut the leaf from printer paper, and adhered it to the white card stock using E-Z Dots® Repositionable Refillable to hold it firmly down. 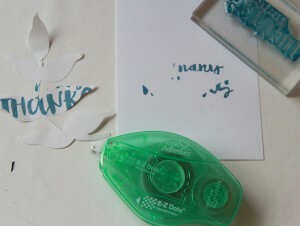 I then stamped the sentiment over the printer paper and slowly removed it from the white card stock. 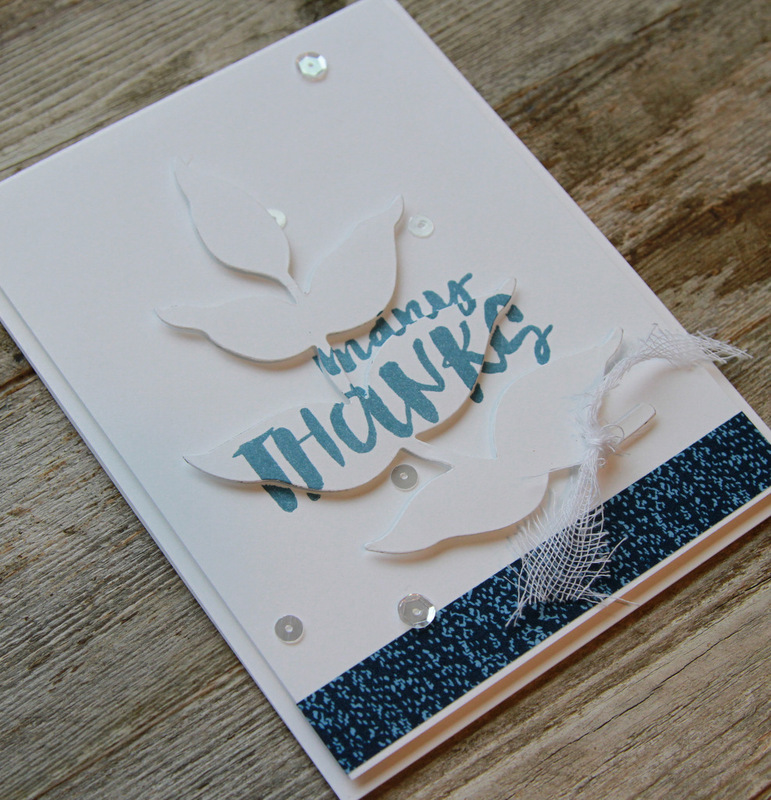 Next, I then stamped the sentiment onto my card stock die cut. Cover the back with 3D Foam Squares, and place right where the stamped void was on the panel. I adhered a strip of washi tape to the bottom and tied a piece of Gauze around the bottom of the leaf die before popping that layer up with Crafty Foam Tape. I finished the card off with a few sequins. Stamps-Wplus9/Simon Says Stamp; Sequins, Spellbinders Dies, Card Stock, pigment ink. 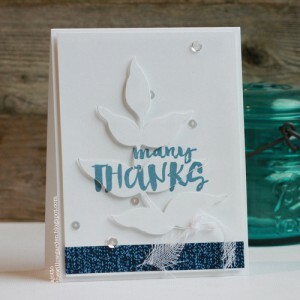 This entry was posted in 3D Foam Squares, Adhesives, Cards, Crafts & Tutorials, Crafty Foam Tape, E-Z Runner® Dispensers and tagged 3D Foam Squares Mix White, 3D Foam Squares Regular White, AJ Otto, Card, Cheesecloth, Crafty Foam Tape White, E-Z Dots Refill Value Pack, E-Z Dots Repositionable Refill, E-Z Dots Repositionable Refillable, E-Z Runner Grand Repositionable Dots Refill, Simon Says Stamp, Spellbinders Paper Arts, Thank You, Wplus9. Bookmark the permalink. One Response to "Many Thanks Card"
What a fun and interesting vocal I love the dimension tfs.